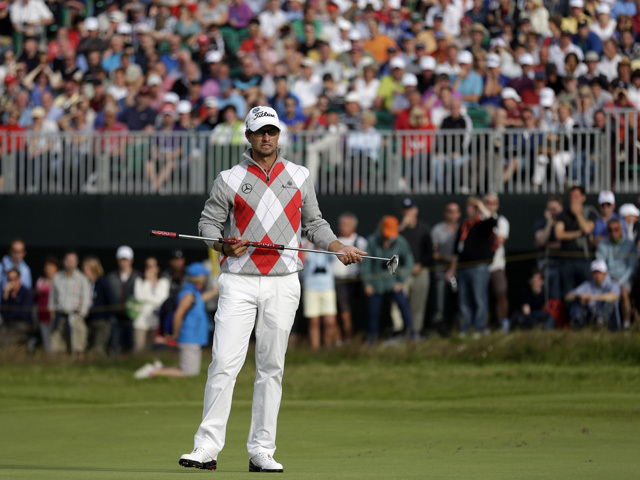 (AP) LYTHAM ST. ANNES, England - Adam Scott has never had a better chance to end that long wait for a major championship  mostly because of that long putter. Scott stayed in the game early with two key par saves, pulled away with three birdies around the turn and was solid at the end Saturday for a 2-under 68 that gave him a four-shot lead going into the final round at Royal Lytham & St. Annes. "It was all pretty solid stuff, considering the circumstances and how much trouble there is on this golf course," Scott said. The golf course, even without wind for three days, swallowed up Brandt Snedeker during a 10-hole stretch in the middle of the round and nearly knocked him out of contention. This is the fourth time in the last nine majors that someone took at least a four-shot lead into the final round. The only player who failed to win was Rory McIlroy at the Masters in 2011. But this Open was far from over. Scott narrowly missed a 20-foot birdie putt on the final hole that would have given him a share of the 54-hole Open scoring record. He settled for 11-under 199 and will play in the final group with Graeme McDowell, who had a 67 to get into the final group for the second straight time at a major. Snedeker birdied two of his last three holes to salvage a 73 and was tied with McDowell. Right behind them were three major champions, starting with the guy who has won 14 of them. Tiger Woods recovered from a sloppy start and was within three shots of the lead on the front nine until Scott pulled away. Woods missed a short par putt on the 15th and didn't give himself many good looks at birdie on the back nine for a 70, leaving him five shots behind. Woods has never won a major when trailing going into the last round. Three-time major champion Ernie Els was solid in his round of 68 and was six back, along with former Masters champion Zach Johnson, who had a 66. Even so, the biggest challenge might be the weather. If the forecast holds true  and there's been no reason to believe that  the greatest defense of links golf could finally arrive with wind projected to gust up to 25 mph. "It will be in Adam's hands tomorrow if the conditions are as straightforward as they have been the last few days," McDowell said. "Throw a bit of wind across this course like perhaps they are forecasting, he will have to go and work a lot harder and he will have to go win it. "He's going to have to go win it anyway, for sure." McDowell was seven shots behind as he walked up to the 13th green and found three birdies coming in to get into the last group, just as he was at Olympic Club last month in the U.S. Open, where he was one putt away from forcing a playoff. Snedeker opened this championship by playing 40 holes without a bogey, and then he couldn't buy a par. He had to blast backward out of a bunker, chunked a pitch shot from the fairway, missed short putts and was reeling. He started with a one-shot lead and was six shots behind after only 11 holes. Snedeker rolled in a birdie on the 16th and stretched out his arms in mock wonder, and then finished with a birdie that could bode well for Sunday. "It's just one of those things where you've got to find out if you have some guts or don't," he said. "I could have packed up and gone home today, but I didn't." Scott was becoming a forgotten star until he switched to the long putter in February of last year, and it has been the biggest reason for the turnaround  his runner-up at the Masters last year, winning his first World Golf Championship at Firestone, and now on the cusp of his first major. It certainly was the key to his third round. Showing nerves on the opening tee, he hit into a bunker and played a beautiful shot from the back of the wet sand to 8 feet, holing the putt for par. Scott made another par putt from the same distance on the third hole. And in the middle of his run of birdies  including a 30-foot putt on the eighth  he escaped with par on the 10th hole by making one from 18 feet. "To make a nice putt like that on the first and make par is obviously very settling," Scott said. "And then to do the same thing on 3, that's been a hole that I haven't parred this week. From there on, I was very settled into the round and started hitting fairways and greens." He played it safe on the back nine, giving himself a few good looks, but mostly making sure he didn't get into position for big numbers. The lone scare came on the 17th, when he pushed his approach into a bunker. Scott looked at the lie and figured he might have a chance to make it. He told his caddie, Steve Williams, "I can handle this one." The shot came out pure, trickled by the cup and settled a foot away. Scott said Williams told him, "I thought you were going to handle it?" It was one of several light moments between a player searching for his first major and a caddie who has been around for 13 of them  all with Woods. The anticipation in the final hour was whether Woods could get into the final group for another reunion with Williams, whom he fired last summer. McDowell took care of that with a late surge, starting with birdies on the 13th and 14th holes, and a 15-foot birdie putt on the 17th. "I kind of felt the tournament perhaps slipping away from me a little bit and really had to dig deep for some patience," McDowell said. "From about the 14th tee onwards, it's probably about as good as I've swung the club all week." Snedeker's bogey-free streak  the longest to start a major championship since at least 1995  ended with a three-putt from just short of the fifth green, and it spiraled from there. With his ball a foot away from a 4-foot bunker wall, he played back toward the fairway and hit a superb pitch from 40 yards to escape with bogey on the sixth. After that, nothing went his way until the end of the round. He will be in the penultimate group with Woods, who has rallied to win from five shots behind  but never in a major. It probably would help for the wind to arrive, although Woods is skeptical about the forecast. Perhaps his best chance is for Scott to struggle with his nerves while going for his first major. "He's been out here a long time," said Woods, who once shared a coach (Butch Harmon) with Scott. "And he's won a Players Championship. I don't think he's really done probably as well as he'd like to in major championships. But I think that he's maturing in his game, and I think over the last year or so he's really improved his game." Luke Donald and Lee Westwood will have to wait to try to win their first major. Donald, the No. 1 player in the world, had a 71 and was 10 shots behind. Westwood played early with Tom Watson and had a 71 to fall 15 shots behind. It's all down to Scott, who turned pro a dozen years ago and was billed as the young Australian who swung the club like Woods. This is his best chance, poised to become the first Aussie since Greg Norman in 1993 to get his name on the claret jug. But this has been a tough year for 54-hole leaders. Five players have rallied from deficits of at least six shots this year to win, a peculiar trend that Snedeker started at Torrey Pines in January. "A four-shot lead doesn't seem to be very much this year on any golf tournament that I've watched," Scott said. "That doesn't mean a lot. The good part is if I play a solid round of golf tomorrow, it will be very hard for the others to beat me, and that's all I'm thinking about." It's best that he not think about how his fellow Aussies have fared. Scott is the fourth Australian to have a 54-hole lead in a major dating to the 2007 Masters. None of the other tree  Stuart Appleby, Aaron Baddeley and Norman  left with the trophy.